Q: "How much is a stamp?" A: "Starting price is from about $150 each upwards depending on the complexity, size and material"
Q: "How much is a small (or large, or medium) stamp?" A: I cannot quote without a measurable size and design image. If you insist, then I guess the answer would be "most stamps can be made for under $2 million"
Q: What is the meaning of complexity? A: The stamp for the letter "I" would be cheaper than letter "N", which in turn are cheaper than the letter "B"
The more turns, holes, and dead ends, the more complex the machining would be and the higher the cost would be. Price of a stamp is dependent on its SIZE, design/machining COMPLEXITY and type of MATERIAL it is made of. Please also provide me with information such as the purpose of the stamp eg. Steel, Leather with hammer, Leather with press, Branding or hot foil. Without the required information above, then there can be no quote. When asking for a quote, please send me a standard measurable units, in centimeter, millimeter or inch. Arbitrary units such as small, large, medium or your grandpa's big toe size is NOT usable. Having said that, I found many customer like to have large stamps, but unfortunately have no means to provide enough force to press the stamp to give good imprint. On steel, you would need at least 200 kg of pressure per each mm² of surface area to be able to imprint well. On leather, roughly 500 kg per each square centimeter (100 mm²) are required. I will make the stamp as requested, you would have to ensure that the setup you have is adequate to provide the force. One of the more popular question is - "What is the size commonly used for XXXX"
Generally for a small knife (up to 6 inch) a good stamp size is what would fit within 10 to 15 mm diameter circle. For a large knife, you could increase to 20 - 25 mm diameter. For blacksmithing touchmarks, usually clients would ask for 25 to 35 mm stamps. It is imperative to understand that the larger the stamp, the more force required to mark the steel. Leather makers stamps are generally fits within 25 to 40 mm diameter. In the past some client would say that they will leave the sizing to my expertise and experiences.. Sorry mate, you got to make up your own mind as to what size and how your logo would come out like. Except for the trial imprint I have no experience whatsoever with YOUR logo stamp and thus am not qualified to make this decision for you. I can only make the stamp or stencils to the size as requested. If you send me an image that have different proportional scale than the requested final size, you would have to tell me if you wish for the image to be stretched to fit or for me to fit the image within the bounding boundary. The main thing that determine the pricing of a job is how complex the design looks. The more difficult it is to machine the more expensive it is to be produced. The rule of thumb in designs is - Keep it simple. Remember the more complex and high detailed your design is, the higher the price it is to make. Thus the reason why I cannot quote without seeing the design. ​Please send your image when asking for a quote. The harder material will last longer and cost more to make. Price of stamps made for leather, steel or branding varies greatly. Again unless I know what you wish to use the stamps for, it would be difficult for me to give you a quote. NEVER send actual size artwork, they are almost always not good enough for stamp or stencil making. Always send larger size artwork and I will scale it down to your requirement. Redrawing fees will be added if image supplies is not suitable for production. It is best to supply your image in VECTOR format such as SVG, DXF, CDR or AI - encapsulated in a PDF. Although it is possible to extract useful details from RASTER format such as jpg bmp or gif images, they are essentially a grey scale and thus do not have clear definition between black and white lines. While either vector or raster format might show up fine on your screen, there are fundamental differences that really determine the final result. 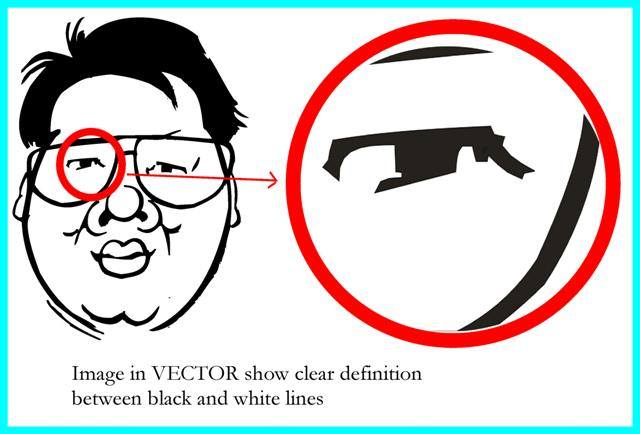 If you are unable to provide vector image, please send your image as a large HIGH RESOLUTION - BLACK and WHITE (monochrome only) at least of 300 dot per inch (DPI) so fine details could be extracted. Please ensure that you do not send me large empty page with small design in the middle (this would be quite useless). The best way to see if your image is good is to enlarge the image to full size on your computer screen, if the edge of the image shows up blurry then most of the time it would not be good enough. On the other hand, large raster images usually show up with very little blurriness and thus acceptable for the data extraction. I find that FREEWARE vector drawing program such as Inkscape works very well in drawing logos. There is no actual color, grey scale or half tone on etching or stamping, like news print all half tone are simulated by varying the size of dots on the print itself, half tone on etching or stamping could be simulated with varying the thickness of your lines. But although this is possible, on the actual manufacturing of the stamp or stencil very fine lines may disappear altogether and the end result may not be as what you think it would be. I strongly discourage the use of grey scales or half tone in the designs. If you really want to do half tone, you would need to vectorize your image and you would be responsible for all the costs of production even if the design do not turn out the way you want them to be. While it is possible to manufacture stamps or stencils down to about 0.1mm lines, it is not recommended to design lines that are thinner than 0.5 mm. On Leather stamps, any lines thinner than 0.5mm would CUT the leather rather than compressing it. On Stencils, lines thinner than 0.5mm might not have enough clearances for the electrolyte to pass through thus the result of the etch may be blotchy. Fine details or character on touchmarks down to 1 mm is possible to be machined, however these would be considered as jewelry stamp grade and this will be EXPENSIVE. They are good for soft metal such as gold and silver, but will not show up well on steel due to the limit of the flow of the steel. Cost for jewelry grade stamps would be MUCH higher than of normal steel stamps due to the complexity of high precision machining required. My suggestion for characters for steel stamps/touchmarks not to be smaller than 2.5 mm tall to ensure good imprint and long life for your stamps. Often fancy fonts are designed into the design, this are Ok, but it would be best to include the TTF file (the actual font files) when you are using fonts that are not native on Windows or Mac. This is to ensure that we could replicate your design properly on the stamps or stencils. On steel touchmarks fancier fonts would increase the complexity of the machining greatly. Unless the photo is clear image of the logo and in black color and pure white background, the chance of extracting data from the photo is exactly zero, so NEVER SEND PHOTO of your logo. Having said the above, I could always help you in producing your logo image for good result in stamping and stencils. This service will provided with a cost, depending on your requirements, the cost will vary from a minimum of $100 to $500 for difficult designs. Time point for design service would vary depending on complexity of the design. The design will be done by outsource, I do not do the design for you, I will send the job out to graphic artist and this will take longer time to be done. 6. Always send the image the way you want the imprint to look like, NEVER SEND MIRRORED IMAGE. If you sent me a mirrored image then you will be charged for the full price again to re make correctly oriented stamp. I would insist on Tracking, and Insurance would be an option to be purchased to ensure peace of mind between you and me. All orders will be posted with tracking number. ​ I need to estimate the posting cost to send the product to you. Payment for Overseas orders can be made with either Paypal or Telegraphic Transfer. Cost for the telegraphic transfer (AU$20) or paypal (7%) payment will be added on top of the quoted price..
All Australian orders need to be paid by Direct Deposit to my bank account. On both instances, no item will be posted or made before the payment is cleared into my account. As in any product made and sold in Australia, you are covered with 12 months warranty for defects due to mistake done in manufacturing. This warranty does not cover misuse such as stamping on harder material than what the stamp is designed for, thermal shocks, heat tempering of touchmarks, over pressuring, stressed and other causes. Costs to return the defective item to me is the responsibility of the buyer.. Check and Recheck the logo you sent to me. Custom work once ordered are not changeable, cannot be cancelled and cannot be refunded.